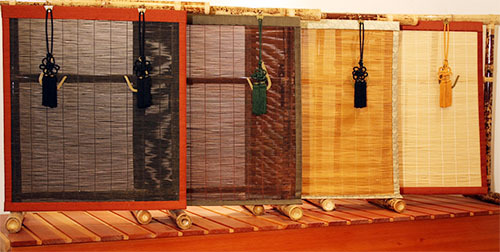 Sudare blinds are made from thin matchstick bamboo, bound on all 4 sides by hand with silk fabric, and finished with a full tassel and brass hardware. Sudare blinds can be made long (72") to hang in front of a tall window, or short (12-14") as a decorative valance in front of a shoji screen window. 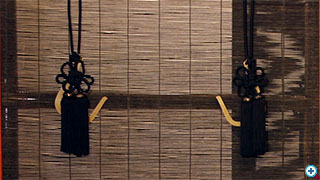 Long sudare blinds are meant to be rolled up by hand into hooks which are attached to tassels. Our selection of stains for sudare bamboo. 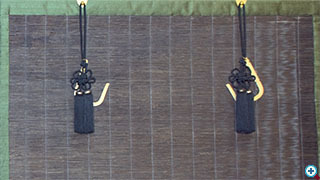 Two sudare panels in ebony stain with moss green silk binding.